You know you have a serious amount of charisma when multiple people who are not family members leave you glittering jewels in their wills. 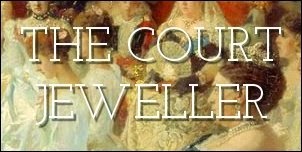 Such was the luck of the Queen Mum, who famously received the gigantic Greville jewel bequest from a family friend; even better, she also inherited today's brooch, the Courtauld Thomson Scallop-Shell, from a loyal subject. The brooch, which features a shell motif in diamonds studded with a single round pearl, was made in 1919 in London by The Goldsmiths and Silversmiths Co., Ltd.. It was designed in part by Sir Courtauld Thomson, son of a famous Scottish inventor. His sister, the writer Winifred Hope Thomson, ended up with the piece, and she was the one who left it to the Queen Mum in 1944. According to Hugh Roberts, Thomson noted that she willed the brooch to the Queen Mum "as a mark of respect and profound admiration." She also indicated that she wanted it to be a brooch that was passed from queen to queen in Britain. The Queen Mum wore the gorgeous brooch throughout her lifetime. It was clearly a valued possession, because she chose to wear it on her 100th birthday in August 2000. When she died two years later, the brooch was inherited by her daughter, Queen Elizabeth II. The Queen has been wearing the scallop-shell brooch more and more in recent years. She even selected it for the wedding of her eldest granddaughter, Zara Phillips, in 2011. She has also worn it for important events related to her mother, including a memorial service marking ten years since the Queen Mother's death and the unveiling of her statue on the Mall.